The windows in your home are valuable features that will change the way you experience your living space. If your current house windows are old and outdated it may be time for a home renovation upgrade. Modernize is here to help if it's time to replace your windows and you need replacement windows in Sioux Falls, SD. We will help you find the perfect contractor to help you with your home window replacement project! We want to help you find the best contractor for your home. Find trusted local window installers today! Get free quotes from the best window replacement contractors in Sioux Falls, SD, ready to complete your project. Regular maintenance of your home is essential if you hope to maintain the value of your home and avoid the annoying consequences of failing to give your home the TLC it needs. One such project is a complete replacement of the windows in your home. Although this home improvement task is not something you will often face, you can expect that you will need to install replacement windows in your home roughly every 10 – 40 years. Since the weather where you live is unique, the windows you buy for your home must be uniquely suited to the climate where you live. Additionally, your home in Sioux Falls has it’s own set of building codes and permit requirements you will want to understand before moving forward with your window replacement project. In this Sioux Falls window buying guide, you can find the information you need to purchase the right windows for your home, including a close look at the weather in South Dakota and any requirements Sioux Falls has for window replacement projects. When you live in Sioux Falls, you experience long winters and a lot of snow. In January, the coldest month of the year, the average low is 7 degrees. The summers are short and mild and the average high is 84 degrees during the hottest month, July. 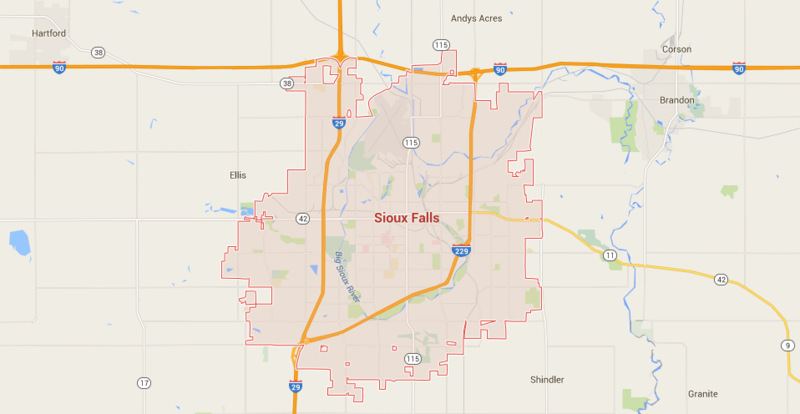 Sioux Falls receives below average rainfall each year, but has an average yearly snowfall of 40 inches, 15 inches more than the national average. The best start when you are searching for the most energy efficient windows for your home in Sioux Falls is to begin by learning to read the National Fenestration Ratings Council label placed on new windows. This label was created by ENERGY STAR® and uses a few different ratings to indicate how just how well certain windows perform in different climates. In a cold climate, your primary concern is keeping your home warm during the winter months. On the label, you find the U-Factor, a measure of how much heat is able to escape your home through the window. In the Northern Climate Zone where Sioux Falls is located, ENERGY STAR® requires replacement windows to have a U-Factor rating of no more than 0.27. The city of Sioux Falls requires you apply for a building permit for all window replacement projects. At the minimum, you will need to submit an estimated cost of the project with your application but you may also be required to include floor plans or building plans along with the application. You can download the appropriate permit application from the Department of Planning & Building Services website. A completed permit, along with any additional documents, can be submitted in person at 224 West 9th Street, Sioux Falls, SD 57117. The office is open Monday through Friday between the hours of 7:00 am and 5:00 pm. If you have specific questions about completing your application you can contact the department directly at (605) 367-8251. The state of South Dakota does not require general contractors to carry a license in order to work. However, you may feel more comfortable working with a licensed contractor who has met state training and work hours minimums in order to obtain their license, and most reputable contractors will provide proof of licensure. Additionally, it is always best to work with a contractor who is fully insured, carrying both workers’ compensation and general liability insurance. When you work with a contractor who is insured, you know that you are protected from the financial consequences that could occur if your property is damaged or if someone is injured while working on your home. With a good understanding of the climate where you live, what makes a window energy efficient, and the unique window replacement requirements in place in Sioux Falls, you can feel confident you have chosen the right windows for your home.